Every type of athlete has a muscular calling card (think: swimmers' sculpted lats, runners' killer quads). For cyclists, it's cut calves that call out to passersby—sinewy and strong as they pump the pedals. And while there is no shortage of impressive gastrocnemii (that's Latin for "stomach of the legs"—fitting, since at their peak, they are the six-pack of the lower body) in Bend. But we have to give props to the gams of one 65-year-old bike mechanic with an awesomely alliterative name: Barb Bohm-Becker. Becker is modest about her oft-admired calves. Though she typically rides more than 100 miles per week and is currently training (on the trails and in the gym) for her first ever mountain bike race, she attributes her shapely legs to genetics. "Do you want to know the secret to getting great calves?" Becker asks. "To be short and have to reach the top shelf." 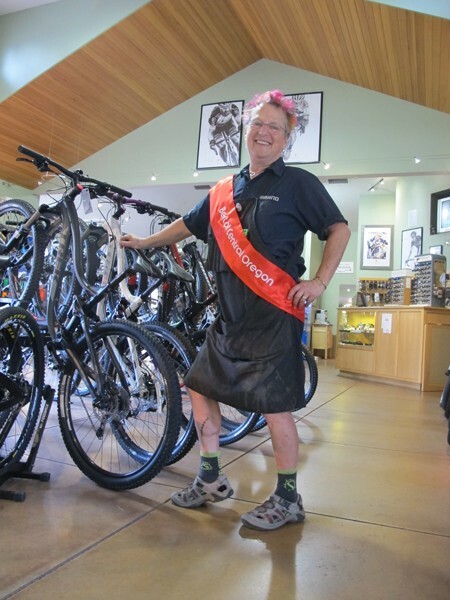 Becker, who has worked as a bike mechanic for Sunnyside Sports for more than 20 years, says she's always gotten comments about her calves, but they weren't always complimentary. And though they keep her from wearing heels much, she says that fact attracted her to counterculture—where she now happily resides with her short, pink-streaked locks.